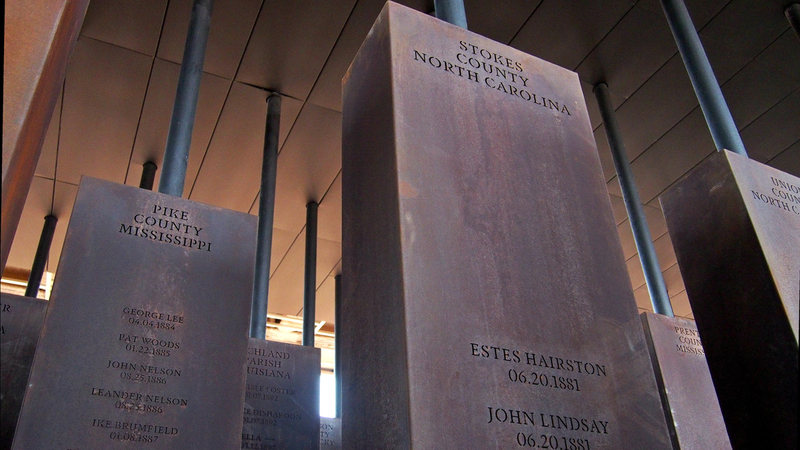 On April 26th the National Memorial for Peace and Justice opens in Montgomery, Alabama commemorating Brooks and over 4400 Black victims of lynching. In preparation for its opening, 60 Minutes’ Oprah Winfrey reported on the museum and the heritage of lynching, and the report included examples of the scores of lynching images that were taken during the racial terror killings of people like Tom Brooks. 60 Minutes chose to show images of lynching in prime time, even as they acknowledged that these pictures are enormously unsettling things: contemporary White audiences are perhaps ashamed to acknowledge the social tolerance for (if not acceptance of) vigilante mob murders; many people are repulsed by the images’ ghastly materiality of torture; and a few consider lynching an anomaly safely lodged in the past, if not a misrepresentation of objective history (compare David Horowitz’s argument that the museum is a “racist project” and suggestion that “many” lynching victims “were guilty of heinous crimes”). A designer’s illustration of the Memorial for Peace and Justice. The NAACP’s The Crisis regularly published lynching pictures, convinced that the undisguised barbarity of lynching photographs would fuel public sentiment against lynching. However, most White newspapers and even a few readers of The Crisis considered the images counter-productive. In February, 1937, for instance, The Crisis responded to a complaint from a reader who objected to an image of Lint Shaw, who had been murdered in Royston, Georgia in April, 1936. A reader suggested that “the printing of such pictures did not aid the fight against lynching, but served only to create racial hatred.” The Crisis responded that they felt “the sheer horror of lynching serves to rouse ordinarily lethargic people to action.” In 1930 the Indianapolis News rejected The Crisis‘ argument when it lamented the widespread circulation of an image of two men lynched in Marion, Indiana (which appeared on the front page of Indianapolis’ African-American The Indianapolis Recorder). The News argued that “a revolting photograph is nothing else, no matter how much a newspaper may urge that its use may teach an object lesson.” However, several days after the murder the paper did publish pictures of curious crowds milling about the tree, and the city’s other White newspaper, The Indianapolis Star, published images of people inspecting the damaged jail from which the prisoners were taken. Wichita’s The Weekly Eagle ran this ad for two months in 1911 selling images of Laura and L.D. Nelson’s lynching in Oklahoma. Despite the 1908 edict, there is little evidence the Postal Service genuinely attempted to restrict the mailing of lynching photographs, which continued to be distributed long after the Post Office’s ruling. In June and July, 1911, for instance, Wichita, Kansas’ The Weekly Eagle ran advertisements selling “those famous lynching pictures from Ofuskee County” Oklahoma for $1 a dozen. On May 25, 1911 an African-American mother and her son, Laura and L. D. Nelson, had been seized from a jail where L.D. was being held for suspected murder and hung from a railroad bridge, and local photographer George Henry Farnum captured individual close-ups of each body and two scenes of the crowds gathered on the bridge (image here). Lynching photography provided a visual rhetoric for mob violence that shaped the process, performance, and staging of lynchings. For instance, perhaps the most unsettling feature of lynching images is their depiction of orderly White perpetrators casually gathered around a corpse or somebody they are preparing to murder. Amy Louise Wood argues that lynching images legitimized collective White violence by portraying these “orderly, respectable mobs” untroubled by the horrific details of hanging, burning, or torture. Sandy Alexandre argues that the visual convention of a victim suspended from an anonymous tree or pole in an unidentifiable place separated from the ground confirmed Black landlessness and material dispossession. 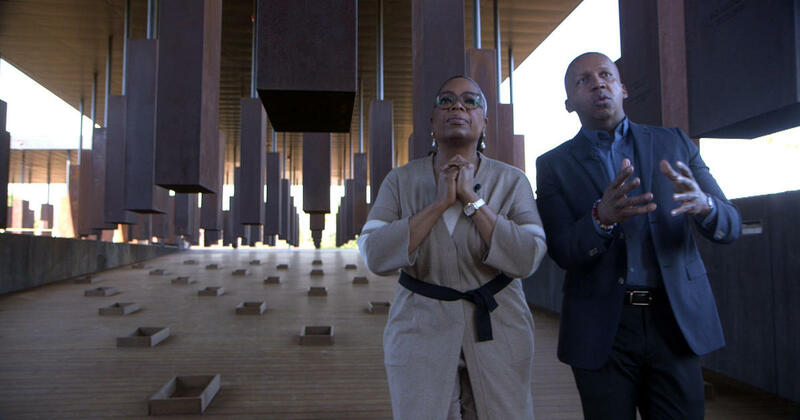 Oprah Winfrey tours the Memorial for Peace and Justice with Bryan Stevenson. The viewers of 60 Minutes may well be unsettled by the images that were part of Winfrey’s report (compare Executive Producer Jeff Fager’s interview on the decision to use the images), and some viewers may find the images traumatizing records of racist violence. Nevertheless, viewing lynching images in mute horror risks ignoring that their visual rhetoric frames how we view images like Michael Brown’s body lying on Canfield Drive. 60 Minutes aspired to compel audiences to look at and experience distress, but historical apologists risk reducing such images to macabre anomalies at odds with America’s otherwise democratic ideals. Beyond their capacity to publicly acknowledge the history of racist violence, the real power of lynching images may be to face up to the ways the visual rhetoric and rationalizations for lynching continue to shape life along and across the contemporary color line. 2012 The Properties of Violence: Claims to Ownership in Representations of Lynching. University Press of Mississippi, Jackson. 2000 Without Sanctuary: Lynching Photography in America. Twin Palms Publishers, Santa Fe, New Mexico. 2004 Imagery of Lynching: Black Men, White Women, and the Mob. Rutgers University Press, New Brunswick, New Jersey. 2015 Lynching in America: Confronting the Legacy of Racial Terror. 2001 A Lynching in the Heartland: Race and Memory in America. Palgrave Macmillan, New York. 2008 Exhibiting Racism: The Cultural Politics of Lynching Photography Re-Presentations. Unpublished Doctoral Dissertation, University of Pittsburgh. 2009 Lynching and Spectacle: Witnessing Racial Violence in America, 1890-1940. University of North Carolina Press, Chapel Hill. Posted on April 14, 2018, in Uncategorized and tagged lynching, Memorial for Peace and Justice, photography. Bookmark the permalink. 1 Comment. I am a resident of Fayette County TN who has spent the last 4 years working on a book about the area’s extensive history concerning racism. I have searched high and low for a photo of Thomas Brooks or the horrific night. I can tell you that I have visited the exact location where Mr. Brooks perished, photographed it, and paid my respects. While the rail bridge is gone, and there is no marker identifying what happened that infamous evening, the two berms and footings that supported the bridge remain. Any assistance in locating said photo would be appreciated.